Do you reside in Westchester County, Katonah, Bedford, Bedford Hills, Mt Kisco, Chappaqua, Armonk and Pleasantville, NY? If you do, you’re aware that winter in the state also increases the risk of grey squirrel, ground squirrels and flying squirrels looking to find shelter in your home. Use this guide to learn the way they enter, the damage they cause, the health risks they pose and how to get rid of squirrels. The roof edge is the part that collects rainwater and melted snow. If this area remains wet for several months, it causes damage to the roof boards and shingles. To enter the house, squirrels chew through the damp area to create an opening through the roof. To allow proper ventilation, an aluminum or plastic vent is installed. Squirrels chew at the vent to gain access to the attic for warmth. Wall vents installed in the bathroom and dryer are located on the exterior walls of the home. On top of the vents are plastic covers that give squirrels access inside the house. Gable vents enable air circulation in the attic. They are installed at opposite parts of the home and are made using aluminum, wood or plastic, which squirrels can chew easily to enter the home. Soffit points are located where the two roofs intersect. Soffit installation can result in a gap big enough for a squirrel to go through, as they do not connect with the shingle on the lower roof. To install a cylindrical plumbing vent, a hole needs to be made and then covered with a rubber mat. The rubber mat is no match for the squirrel, as they can chew through it and enter the attic. Chimneys without a cover, lined with clay, steel and bricks allow the squirrels to enter and make a nest there. 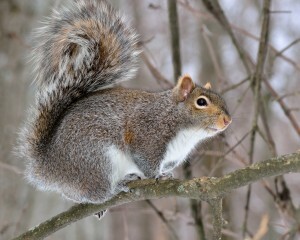 It is important to contact a squirrel removal service such as the Pinnacle Wildlife Control. What Damages do Squirrels Cause? Squirrels can damage the shingles, fascia boards, outer panels of the roof and eavestroughs. A squirrel in the attic can damage the insulation, create burrows, cause a roof leak and create a fire hazard by chewing through electrical wiring. Squirrels can chew around ridge vents, roof vents, plumbing vents and chimney. Call Pinnacle Wildlife Control, a professional squirrel pest control service. If squirrels remain inside the walls or attic for too long, they can cause water damage due to the trail of urine and feces they leave behind. Contact a squirrel control service before it’s too late. Squirrels carry a host of diseases such as the plague, encephalitis, Colorado tick fever, louse-borne typhus and tularemia. They can also bring mites and ticks into the house, which can result in Lyme disease and salmonella. Trim tree limbs near the house, keeping them six to eight feet away from the roofline. Close and seal any small openings around the house such as openings in roof vents, ridge cap vents, dryer vents and gable vents. Seal all small openings and cracks around the house. Contact Pinnacle Wildlife Control for squirrel removal if you reside in Westchester County, Katonah, Bedford, Bedford Hills, Mt Kisco, Chappaqua, Armonk and Pleasantville, NY.